Sensodyne Whitening Plus Tartar Fighting toothpaste helps restore the natural whiteness of your teeth. With twice a day brushing it builds 24/7 protection against sensitivity that doesn't wear off when you eat or drink, reduces tartar build-up, removes plaque, and prevents cavities. The formula also has a fresh minty taste to help freshen breath. It really does help people like myself with sensitive teeth. I haven't ever had problems since starting this toothpaste. I don't think it actually whitens, which would make it a much better product. 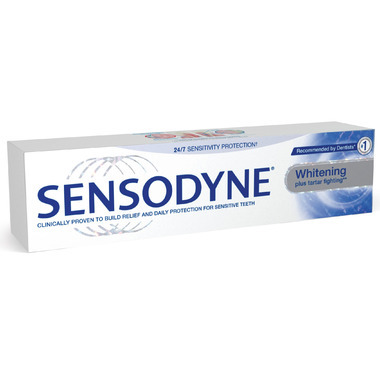 Sensodyne is a must for anyone with oral sensitivity and it works. My dentist recommended the product when it first came on the market and still does.